Moly Roller Chain Lube is blended with penetrating oils, special friction releasing and extreme pressure additives, and rust and corrosion inhibitors. Moly Roller Chain immediately goes to work penetrating and lubricating pens, bushings and metal surfaces without attracting dust. 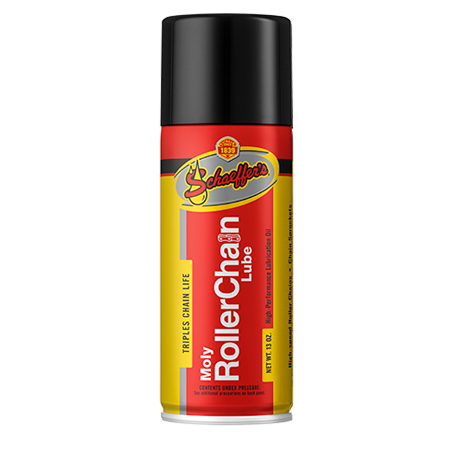 Moly Roller Chain Lube forms a solid, longer lasting film that rejects abrasive particles and moisture. This protective layer is capable of withstanding pressures up to 500,000 psi and reduces friction for longer equipment life. Powerful protection against rust and corrosion. O-ring safe: will not swell or shrink O-rings. Quickly produces flexible chain action. Will not affect any seal materials and coatings. Superior extreme pressure and anti-wear properties that increase chain life.